A group of Call of Duty glitchers has been called back to Infinity Ward to help the studio test and shore up the game's multiplayer, according to the gang's leader. This isn't the first time mapMonkeys have assisted on a Call of Duty project, according to founder Rezzzo. 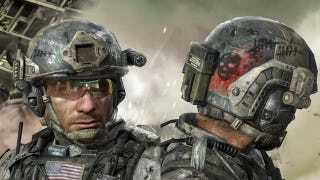 He says members had been flown to test Call of Duty: World at War and Modern Warfare 2. If you're recalling all sorts of glitches or exploits in those games, "we only had two or three days to test the game and find glitches, which wasn't nearly enough time," Rezzzo says. "This time, Infinity Ward is keeping us there an entire week so we can find more bugs and glitches than ever before!" His post on a mapMonkeys forum says they arrived at the testing location today. "I know this goes against mapMonkeys since we thrive off of finding and sharing glitches with each other," Rezzzo says, "but this is an amazing opportunity we can't pass up!" Ah, poor glitchers, sold out by one of their own for an advance peek at a game. Kotaku left a message Saturday for an Infinity Ward representative. It was not immediately returned.